Statistics does not tell us whether we are right. It tells us the chances of being wrong. Quality is often more important than quantity. The meaning of error bars is often misinterpreted, as is the statistical significance of their overlap. Good experimental designs mitigate experimental error and the impact of factors not under study. Flybase has direct access to its postgres chado database. 这个数据库的作者在2011年发了一篇如何寻找融合基因的文章：*Edgren, Henrik, et al. "Identification of fusion genes in breast cancer by paired-end RNA-sequencing." Genome Biol 12.1 (2011): R6. One of the latest therapeutics angles in the fight against cancer is fusion genes and their regulation. To aid in fusion gene research and reveal the multitude of gene fusion event in cancer samples MediSapiens has developed a proprietary FusionSCOUT pipeline for identifying fusion genes from RNA sequencing datasets. Currently we have analysed 7625 tumour samples from the TCGA project building a fusion gene dataset covering 28 different cancers within the TCGA project which can be accessed through our FusionSCOUT product. Using this pipeline, we have discovered 3930 samples with gene fusions with 9667 different fusion genes. We´ve discovered numerous novel gene fusions as well as new cancer types in which previously known fusions appear. With FusionSCOUT you can access the full listings of all fusion genes in specific cancer datasets. Find new leads for possible cause of the cancer, examine the pathways that are affected by different fusions, stratify patients by shared fusion genes or search for potential target for drugs and companion diagnostics. Once you purchase a FusionSCOUT dataset we will send you a detailed report with information on the fused genes, sample ID from the TCGA dataset, fusion frequencies across the dataset as well as fusion mRNA sequences and lists of protein domains present in the fusion transcripts. Check out also our Fusion Gene Detection pipeline service for your samples! Dataset missing? Email us and well add your favorite dataset to FusionSCOUT! The American Society for Microbiology (ASM) is the oldest and largest single life science membership organization in the world. Membership has grown from 59 scientists in 1899 to more than 39,000 members today, with more than one third located outside the United States. The members represent all aspects of the microbial sciences including microbiology educators. The mission of ASM is to promote and advance the microbial sciences. ASM accomplishes this mission through a variety of products, services and activities. We provide a platform for sharing the latest scientific discoveries through our books, journals, meetings and conferences. We help strengthen sustainable health systems around the world though our laboratory capacity building and global engagement programs. We advance careers through our professional development programs and certifications. We train and inspire the next generation of scientists through our outreach and educational programs. ASM members have a passion for the microbial sciences, a desire to connect with their colleagues and a drive to be involved with the profession. Whether it is publishing in an ASM Journal, attending an ASM meeting or volunteering on one of the Society's many boards and committees. Big parts of our everyday lives, from energy production, waste recycling, new sources of food, new drug development and infectious diseases to environmental problems and industrial processes-are studied in the microbial sciences. Microbiology boasts some of the most illustrious names in the history of science--Pasteur, Koch, Fleming, Leeuwenhoek, Lister, Jenner and Salk--and some of the greatest achievements for mankind. Within the 20th century, a third of all Nobel Prizes in Physiology or Medicine have been awarded to microbiologists. The ASHI 41st Annual Meeting site is now live, for the latest updates visit 2015.ashi-hla.org. The American Society for Histocompatibility and Immunogenetics (ASHI) is a not-for-profit association of clinical and research professionals including immunologists, geneticists, molecular biologists, transplant physicians and surgeons, pathologists and technologists. As a professional society involved in histocompatibility, immunogenetics and transplantation, ASHI is dedicated to advancing the science and application of histocompatibility and immunogenetics; providing a forum for the exchange of information; and advocating the highest standards of laboratory testing in the interest of optimal patient care. The Bioinformatics Open Source Conference (BOSC) is an academic conference on open source programming in bioinformatics organised by the Open Bioinformatics Foundation. The conference has been held annually since 2000 and is run as a two-day satellite meeting preceding the Intelligent Systems for Molecular Biology (ISMB) conference. 20 2451451 . G T 1939.77 . 他的课程包括Molecular Basis of Cancer (BIO5288) and Genetics and Genomics of Disease (BIO5487) at Washington University School of Medicine. I was a TA for Genome Analysis (MEDG505) and the bioinformatics section of Advanced Human Molecular Genetics (MEDG520) and a guest instructor for Cell Biology For Biomedical Engineering Graduate Students (APSC552), Cell and Organismal Biology (BIOL111) and Cell Biology (BIOL200) at UBC. Personalized medicine and economic evaluation in oncology: all theory and no practice? Feasibility of large-scale genomic testing to facilitate enrollment onto genomically matched clinical trials. Meric-Bernstam F et al. J. Clin. Oncol. 2015 May 26. Brave-ish new world-what's needed to make precision oncology a practical reality. MacConaill LE et al. JAMA Oncol 2015 Jul 16. Multigene panel testing in oncology practice - how should we respond? Use of whole genome sequencing for diagnosis and discovery in the cancer genetics clinic. Accelerating the delivery of patient-centered, high-quality cancer care. Next-generation clinical trials: Novel strategies to address the challenge of tumor molecular heterogeneity. A decision support framework for genomically informed investigational cancer therapy. Companion diagnostics: the key to personalized medicine. Promoting precision cancer medicine through a community-driven knowledgebase. Geifman N, et al. J Pers Med. 2014 Dec 15;4(4):475-88. Toward a prostate cancer precision medicine. Rubin MA. Urol Oncol. 2014 Nov 20. Prioritizing targets for precision cancer medicine. Toward precision medicine with next-generation EGFR inhibitors in non-small-cell lung cancer. Yap TA, Popat S. Pharmgenomics Pers Med. 2014 Sep 19;7:285-95. Genomically driven precision medicine to improve outcomes in anaplastic thyroid cancer. Translating genomics for precision cancer medicine. Tomczak K, et al. Contemp Oncol (Pozn). 2015; 19(1A): A68-A77. Molecular classification of gastric adenocarcinoma: translating new insights from The Cancer Genome Atlas Research Network. TCGA data and patient-derived orthotopic xenografts highlight pancreatic cancer-associated angiogenesis. Gore J et al. Oncotarget 2015 Feb 25. Radiogenomics of clear cell renal cell carcinoma: preliminary findings of The Cancer Genome Atlas-Renal Cell Carcinoma (TCGA-RCC) Imaging Research Group. Shinagare AB et al. Abdom Imaging 2015 Mar 10. Proteomics of colorectal cancer in a genomic context: First large-scale mass spectrometry-based analysis from the Cancer Genome Atlas. Jimenez CR et al. Clin. Chem. 2015 Feb 26. Identifying driver mutations in sequenced cancer genomes: computational approaches to enable precision medicine. Novel recurrently mutated genes in African American colon cancers. Sparse expression bases in cancer reveal tumor drivers. Patient-specific driver gene prediction and risk assessment through integrated network analysis of cancer omics profiles. CaMoDi: a new method for cancer module discovery. Manolakos A, et al. BMC Genomics. 2014 Dec 12;15 Suppl 10:S8. VHL, the story of a tumour suppressor gene. Targeting the MET pathway for potential treatment of NSCLC. Deciphering oncogenic drivers: from single genes to integrated pathways. Chen J, et al. Brief Bioinform. 2014 Nov 5. Driver and passenger mutations in cancer. Testing for hereditary breast cancer: Panel or targeted testing? Experience from a clinical cancer genetics practice. Hereditary colorectal cancer syndromes: American Society of Clinical Oncology clinical practice guideline endorsement of the familial risk-colorectal cancer: European Society for Medical Oncology clinical practice guidelines. Population testing for cancer predisposing BRCA1/BRCA2 mutations in the Ashkenazi-Jewish community: A randomized controlled trial. Cost-effectiveness of population screening for BRCA mutations in Ashkenazi Jewish women compared with family history-based testing. Manchanda R et al. J Natl Cancer Inst. 2014 Nov 30;107(1). pii: dju380. doi: 10.1093/jnci/dju380. Print 2015 Jan.
EGAPP: A model process for evaluating genomic applications in practice and prevention. Check out cancer genomic tests, methods, evidence reviews and recommendation statements. 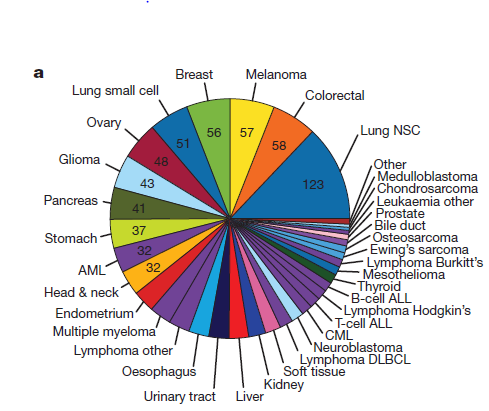 Multiplatform analysis of 12 cancer types reveals molecular classification within and across tissues of origin. NIH information: What is cancer genomics and the genetic basis of cancer? The Cancer Genome Atlas (TCGA) is a comprehensive and coordinated effort to accelerate our understanding of the molecular basis of cancer through the application of genome analysis technologies, including large-scale genome sequencing. TCGA is a joint effort of the National Cancer Institute (NCI) and the National Human Genome Research Institute (NHGRI), which are both part of the National Institutes of Health, U.S. Department of Health and Human Services. This is the schedule for the 2014 MSU NGS course. This workshop has a Workshop Code of Conduct. 7:15pm tutorial, Mapping reads to transcriptomes (Trinity and SOAP) and counting. 2:00pm lecture, A tableside discussion on transcriptome assembly PDF (Matt). 8pm: invited speaker (NGS/EDAMAME) Jack Gilbert Note: Talk is in academic building auditorium. I'm using samtools mpileup and would like to generate both a pileup file and a vcf file as output. I can see how to generate one or the other, but not both (unless I run mpileup twice). I suspect I am missing something simple. 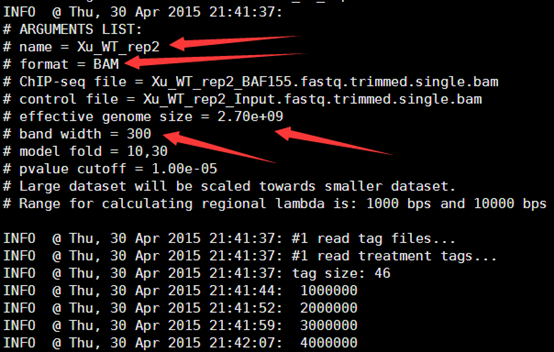 Specifically, calling mpileup with the -g or -u flag causes it to compute genotype likelihoods and output a bcf. Leaving these flags off just gives a pileup. Is there any way to get both, without redoing the work of producing the pileup file? Can I get samtools to generate the bcf _from_ the pileup file in some way? Generating the bcf from the bam file, when I already have the pileup, seems wasteful. bcftools doesn't work on pileup format data. It works on bcf/vcf files. samtools provides a script called sam2vcf.pl, which works on the output of "samtools pileup". 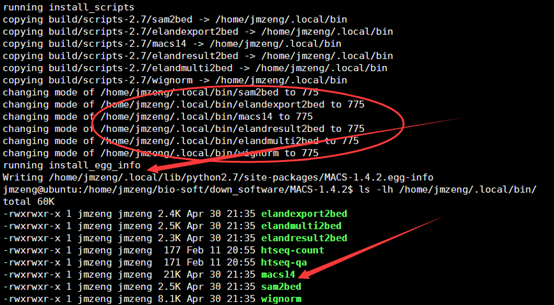 However, this command is deserted in newer versions. The output of "samtools mpileup" does not satisfy the requirement of sam2vcf.pl. You can check the required pileup format on lines 95-99, which is different from output of "samtools mpileup".